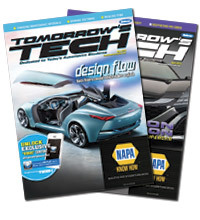 Tomorrow’s Tech (TT) delivers technical information for servicing today’s vehicles to more than 40,000 automotive students enrolled in more than 1,100 technical and vocational schools across the country. MAHLE Aftermarket Inc. has announced a “King of the Hammers” (KOH) Casey Currie Contest that will offer two grand prizes for off-road enthusiasts of MAHLE Service Solutions shop equipment, plus weekly prize packets from MAHLE and Currie. Contestants may enter by posting pictures or videos of their Jeep or off-road adventures on Instagram, Twitter or Facebook using the hashtag #MAHLEKoH. MAHLE will select the winners of the weekly prize packs, which will feature MAHLE and Casey Currie t-shirts and hats signed by Currie and a MAHLE air filter and oil filter for a 2007-‘18 Jeep JK. Two grand prize winners will be selected from the weekly winners and will receive the first prize of a NitroPRO Nitrogen Top Off Gun valued at $500, or the second prize of a pair of ShopPRO 7-1/2 Ton Jack Stands valued at $300. MAHLE Aftermarket and Currie will have special giveaways exclusively for attendees at the 2019 King of the Hammers, taking place Feb. 1-9 in Johnson Valley, California. The MAHLE King of the Hammers Casey Currie contest ends Feb. 10. Full rules and restrictions can be found at: woobox.com/bzde6f. Entries will appear at this site in a gallery. The contest is open only to U.S. residents, no purchase is necessary. Winners will be contacted via social media for details on prize shipment.